Our wide definition of community development includes intentional collective actions to improve social, economic, physical, and environmental well-being, while preserving valuable aspects of the culture of the particular geographic area. The U.S., Europe, and Canada especially emphasize, the durability and adaptability of the housing stock as a major topic of community development. In some parts of the world, war, disease, famine, extreme poverty, and climate change may threaten human life and social organization at such a basic level that community development must focus primarily on helping people overcome those threats to stability. 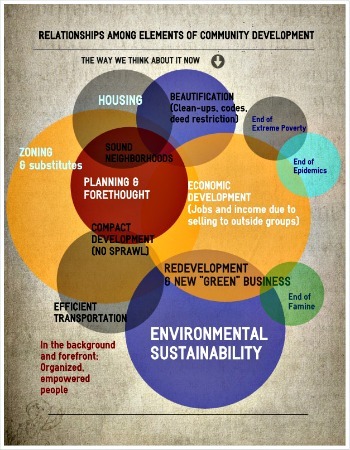 The subjects are so interwoven that our graphic above shows overlapping sub-sets of the community development idea. We second-guess our own diagram often, because we see a different way that the threads of community improvement are interrelated each time we focus on a real-life example. You are welcome to criticize and wonder too, using your own community as a reference point. The topics in this section, complementing our definition of community development, are shown in the links below. This article resumes after that, giving you some more concrete ways to think about the definition. International community development conversations often focus on another meaning, which emphasizes eradication of extreme poverty and then building the physical and economic infrastructure and organizing a society that can communicate, sell, and buy globally. We hope that the notion of developing capacity of the entire population to participate meaningfully in community decision-making is included. In the global context, the definition of community development tends to be entangled with trying to imitate Western-style development. However, retracing the mistakes of the "developed" world is not necessarily the best way to move forward. World-wide, humanity can avoid the mistakes that now threaten environmental sustainability, economic stability, and development of a middle class because of a concentration of wealth and power in the hands of a few. A more productive approach arises from appreciating local experience, history, and creativity, while learning from the best practices of others. In the U.S., a federal program has influenced the definition of community development too much. Since 1964, the term community development has become almost synonymous with the Community Development Block Grant. Since that program requires that the benefits flow primarily to people of low and moderate income, an undeserved narrowness has been attached to the phrase community development. It is usually a good program and one I have managed, but community improvement is necessary and gratifying across the entire economic spectrum. Other nations may have similar difficulties with the local population identifying the term too much with a specific program or set of initiatives. It's a challenging definition of community development already, but your community may see that you also need to focus on promoting creativity, leadership, social equity, more emotional ownership of neighborhood outcomes, or increased coordination and networking among organizations and sectors that affect how well your community is positioned for the future. So you can see that community development applies to people of all income levels, including low, moderate, and lavish. It is important to understand community development principles, as explained in an illustrated essay based on three in-depth example communities. No system is immune to the laws of cause and effect. When we think more profoundly, based on examples we see around us, we can reclaim the complexity and richness of the phrase community development. Increasing the number of people who understand cause and effect in community work can expand your impact exponentially. Lastly, a visitor to the site asked about the purpose of community development. It's an important thought, and our best try at answering the "why" question is on the page in the link.